For the registration of a domain name, most registries require transfer of accurate data of the holder, which data will be published in a WHOIS-database. In general the transferred data contain name, address, e-mail address, telephone number and fax number. False information may lead to the suspension or even the cancellation of the domain name. Information about domain holders is available publicly through a so-called WHOIS search. 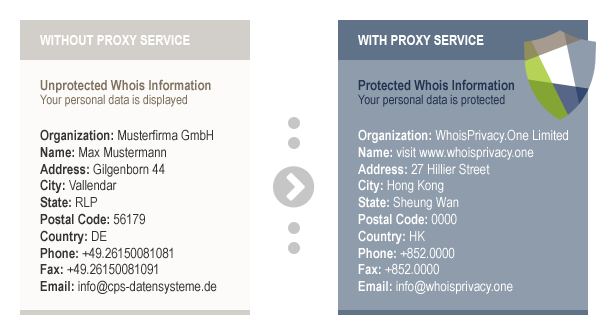 The WHOIS-Proxy Service of CPS-Datensysteme GmbH renders this information anonymous. This will prevent effectively the abuse of this information for spam, harrassment or identity fraud. Despite his or her anonymity, the domain holder remains achievable: the current domain holder can be contacted any time by email through the website www.whoisprivacy.one. Our WHOIS-Proxy Service is in complete accordance with the ICANN guidelines.